In a moderate seabreeze the two Laser fleets yesterday finished their qualifications for todays medal races. 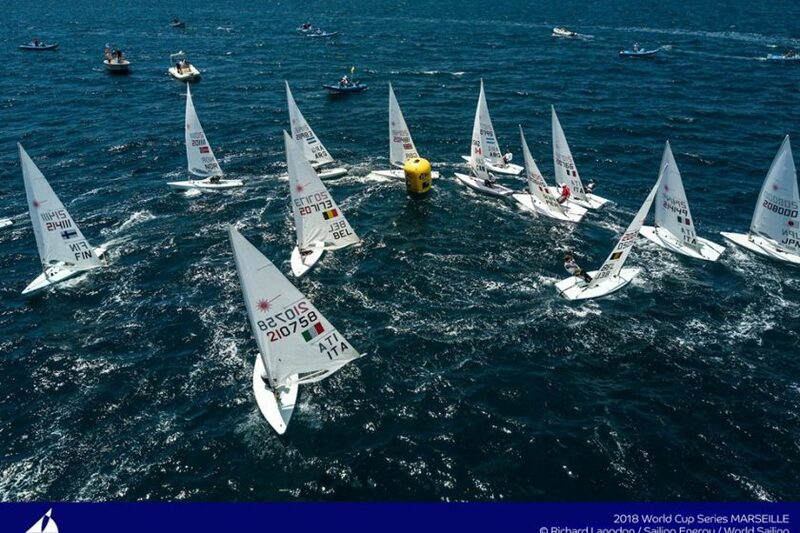 Change on top of the Laser Standard after former leader Nick Thompson GBR booked a second double digit result. Hermann Tomasgaard NOR is now leading just one point ahead of Philipp Buhl GER, Thompson is another 2 points back on 3. In the hunt for gold also Elliot Hanson GBR on 4th just 8 points back. In the Laser Radial Emma Plasschaert BEL is on the way to victory. Her 16 points of advance on Maria Erdi HUN should be sufficiont to stay ahead today. The Hungarian herself will grab the silver medal, she is 17 points ahead of Tuula Tenkanen FIN. Maud Jayet SUI – yesterday daily first by posting a 1st and a 3rd. Moved up to 4th just one point behind Tenkanen. Just one point more behind on 5th Veronika Andrulyte LTU. All rankings, the daily report and the videos.